Both Vinyl and linoleum are sanitary, easy to maintain and fabricated into tiles and sheets. Although they resemble each other, each possesses its own unique attributes. Vinyl is made from synthetic fibers. The main body is covered with a sheet containing a printed photograph image, another sheet for the finish and then a protective coat. Vinyl is highly resistant to humidity making it a good choice for a bathroom or basement. It works best in medium to low traffic areas, and has a warranty range from 5 to 20 years in a residence. 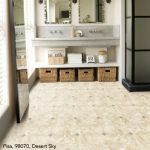 Vinyl flooring is comparably more affordable than linoleum. Vinyl Sheet Flooring: Resilient flooring, available in roll form, providing an installation with few seams. Linoleum is an all natural product made from renewable raw materials pressed into a jute backing. It has a natural look, is biodegradable, antiallergenic and antibacterial. Its antistatic surface repels dust (beneficial in rooms equipped with electronic components), is durable, quiet, suitable for heavily trafficked areas and feels good underfoot. The lifespan of a linoleum floor in a commercial setting can easily extend to 40 years.